Designer Shoe Warehouse ("DSW") has a great new addition to their website. DSW recently launched Luxe810, at dsw.com/luxe810, which is their luxury designer shoe collection. For those who are not familiar with DSW, DSW is a branded footwear retailer. DSW has any sort of shoe imaginable for children, men, and women at discounted prices. Women's shoes consist of sneakers, heals, flats, boots, booties, wedges, sandals, flip flops, special occasion shoes, etc, etc, etc. I checked out Luxe810 and although prices are still steep even at their discounted rate, I added some shoes to my wish list. A girl can dream, right? Their luxury collection features designer shoes such as Gucci, Miu Miu, Sergio Rossi, Giuseppe Zanotti, Marc by Marc Jacobs, Jimmy Choo, Yves Saint Laurent, Burberry and Prada just to name a few. Below are my favorite picks from left to right! 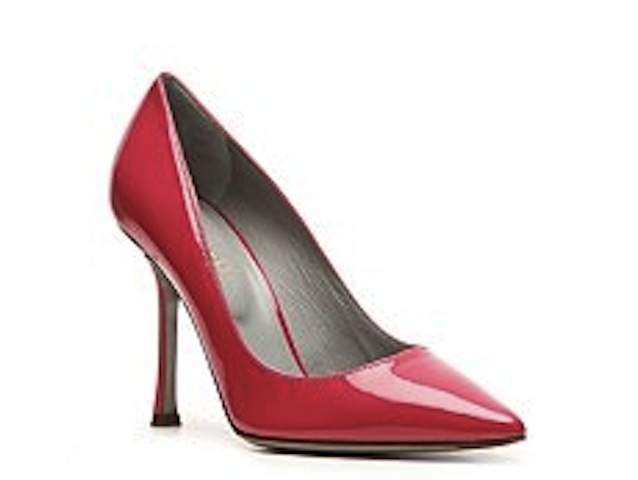 I love the pink color on the Sergio Rossi Patent Leather Pumps (Sale $249.95) in Pink. The pumps have a pointed toe, 3 3/4 inch heel, leather sole and are lined in leather. The color is what attracted me to these pumps as they are perfect for the upcoming spring and summer. As an added bonus, they look super comfortable. These pumps will surely spruce of up any outfit! The second pair are these super fun Herve Leger Olesia Leather Strappy Sandals (Sale $399.95) in Black. These sandals have a back zipper, almond shape toe and a 4 inch heel. I absolutely love all the straps on these sandals. The sandals are so different from your standard black sandal and would spice up a little black dress (or ANY dress) or would spice up a casual outfit with jeans or black pants. The third pair are the Givenchy Leather Ankle Strap Sandal (Sale $499.95) in Sand. The sandals have an ankle strap with an adjustable buckle, almond shape toe and a 4 4 1/2 inch heel. I could see these sandals being paired with a bright dress, a little black dress (LBD), a sequin dress, leggings, jeans, etc! These sandals can pretty much be paired with any outfit due to the neutral color. Last but not least I absolutely loveeee the Giuseppe Zanotti Leather Plate Sandals (Sale $1,195.95) in Blush. The sandals have these really cool gold colored plates running in the front, back zipper, round peep toe, and a 4 1/4 inch heel. However, realistically the price is very steep but I do love the look and design. I also wanted to add that from March 4-12, 2013 if you have a rewards card you can recived $40 off $199, $100 off $399, or $299 off $599 with code "LUXE810." It's super easy to sign up for their rewards card - you can do it online! Have any of you checked out their webiste yet?